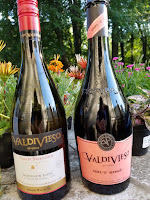 I recently received review samples of four entry level Chilean wines, two each from Valdivieso and Ventisquero. Valdivieso became Chile and South America's first sparkling wine producer when in 1887, founder Don Alberto Valdivieso, released Champagne Valdivieso. Close to a century later the winery added still wines to their portfolio and today work with close to a dozen grape varieties. The current winemaker is New Zealand native Brett Jackson who has quite the resume working in New Zealand; Napa Valley; Stellenbosch, South Africa; and Narbonne, France before joining Valdivieso in 1999. Valdivieso Valley Selection Sauvignon Blanc 2015 ($15) The 100% Sauvignon Blanc is from the Leyda Valley. The cooler valley provides slower and gentler ripening allowing the grapes to retain acidity. This is an excellent wine, tropical aroma, weighty lemons, and abundant acids. 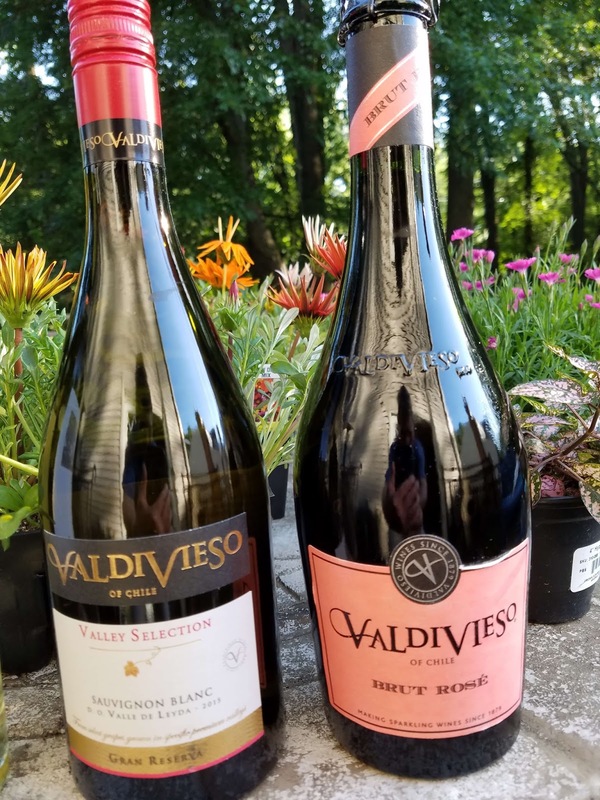 Valdivieso Brut Rose NV ($13) Comprised of 70% Pinot Noir and 30% Chardonnay all sourced from the foothills of the Los Andes mountain range in the Central Valley wine region. Secondary fermentation is achieved using the Charmat method. This value is incredible as the sparkler holds its own being dry with abundant flavors and a smooth effervescent finish. Ventisquero is a younger entity founded in 2000 in the Maipo Valley. But under the guidance of winemaker Felipe Tosso they have expanded into other regions leveraging the expanding Chilean vineyard landscape. They just don't source the grapes but own the vineyards in Apalta, Lolol and Peralillo in Colchagua, Casablanca, Maipo, Leyda and Atacama. 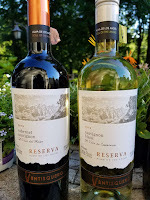 I was sent two wines from the Reserva label, one of nine labels in the Ventisquero brand. Ventisquero Reserva Sauvignon Blanc 2016 ($15) The 100% Sauvignon Blanc is sourced from the sandy-clay soils of the Casablanca Valley. After fermentation the wine is aged on its lees for four months which provides a creamy depth to the soft lemon melon aromas and refreshing acids. Another great buy. Ventisquero Reserva Cabernet Sauvignon 2015 ($17) The 85% Cabernet Sauvignon and 15% Syrah are sourced from the Maipo Valley where the soils are granite and stony. This is a very smooth wine with some chocolate leather and tobacco on the nose, a little dustiness, and very approachable tannins.Well done. One of the many benefits of attending TasteCamp is that the focus extends beyond wine and always includes beer, cider, and spirits. 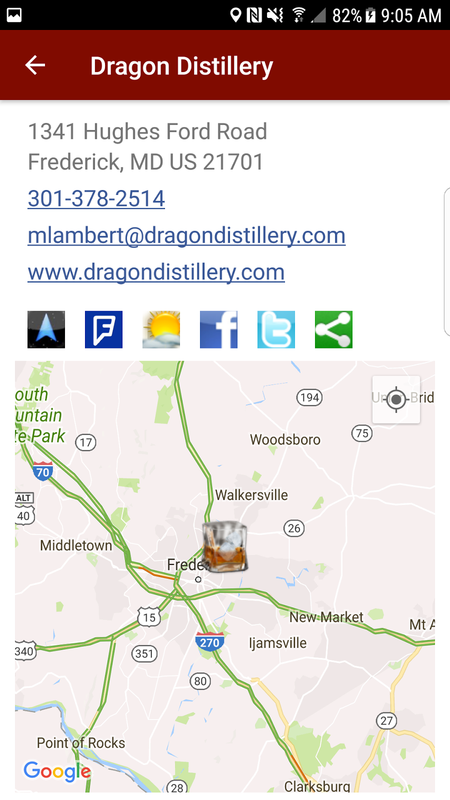 TasteCamp Maryland was able to leverage the spontaneous and organic craft distillery eruption in the town of Frederick; today the area supports three craft distillers when two years ago, none existed. 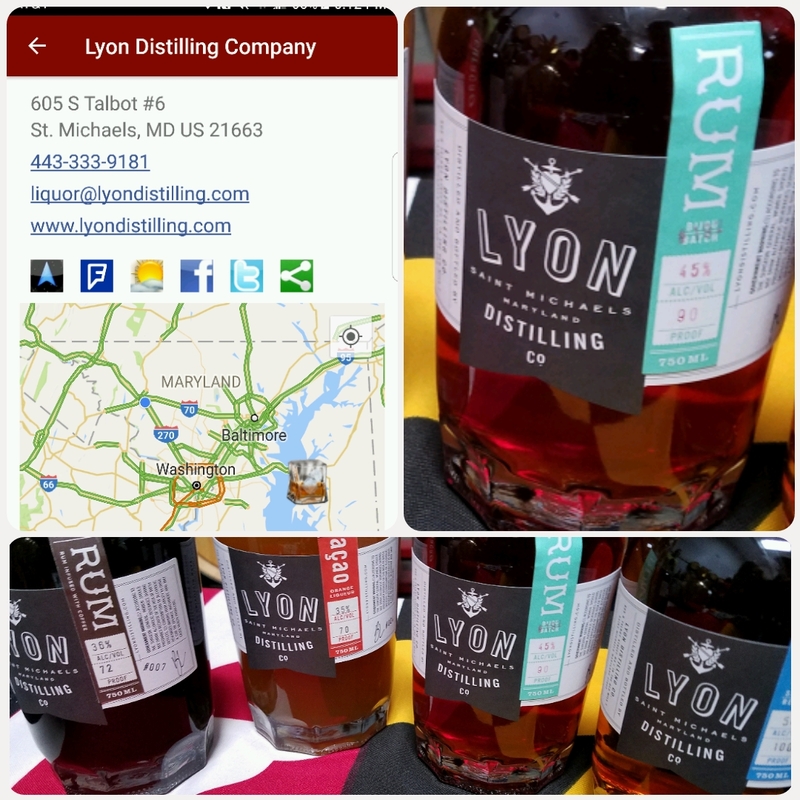 During the weekend we were able to sample spirits from these distilleries as well as from Lyon Distilling, located in Maryland's Eastern Shore. 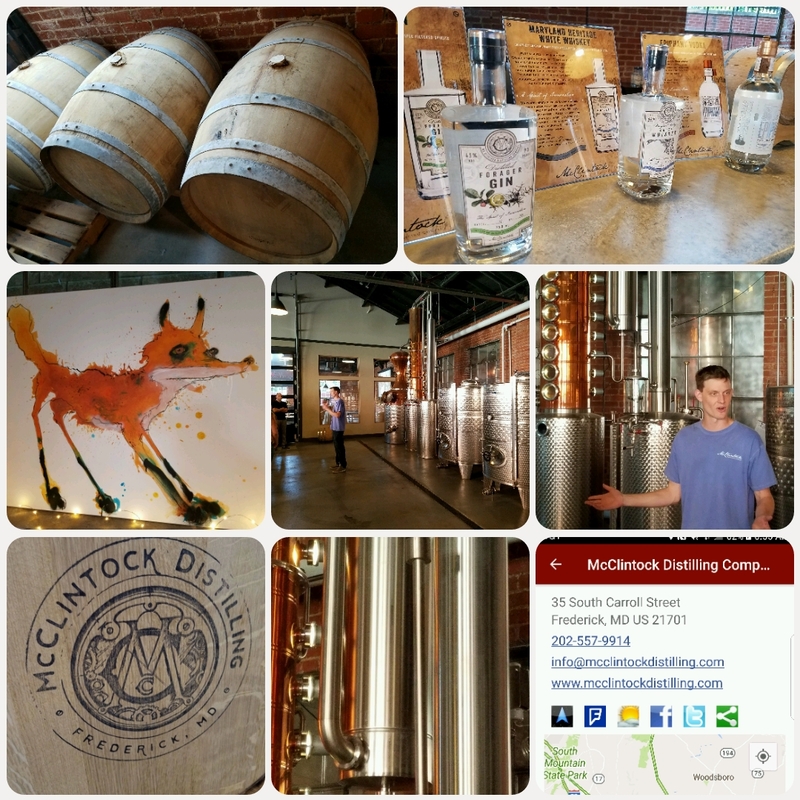 The main spirits tasting occurred at McClintock Distilling, located in a gutted shell of a 100-year-old mechanic’s garage and owned-operated by college friends Tyler Hegamyer & Braeden Bumpers. Their facility is ingenious, following the footsteps of the distillery's namesake McClintock Young - a renowned local inventor in the 1800’s who patented over 100 inventions. The facility houses many of these inventions and patents, but none compare to the engineering feat in the closed-loop cooling system and water management. This process allows the distillery to reuse tons of water during the cooling process; we are talking about 50 gallons per minute recycled and reused. Their German-made 264-gallon copper still is also ingenious in that it allows the distillers to change the focus of each batch from say vodka to gin quite easily and with a little more ingenuity allows for a dry hopping process where the botanicals seep into a gin through the vapers and not the mash. Nevertheless none of this matters if the spirits don't shine, and in this respect, the three McClintock craft spirits do shine. The Forager Gin is infused with "botanicals inspired by native herbs found in the Appalachian Wilderness" and is refreshing in the sense that the juniper is muted. And there appears to be equivalent citrus character. The Maryland Heritage White Whiskey is based on a "historically derived rye heavy mash bill from pre-prohibition Western Maryland distilleries". The whiskey is then aged for 24 hours in oak which along with the rye provides just a hint of pepper and other spices. But the sweet and mellow corn and wheat provide the strongest influence leading to a very smooth spirit. Finally, the Epiphany Vodka is distilled from Northern Italian organic wheat and double distilled and triple filtered, a process that once again provides a clean and smooth product. Nicely done. 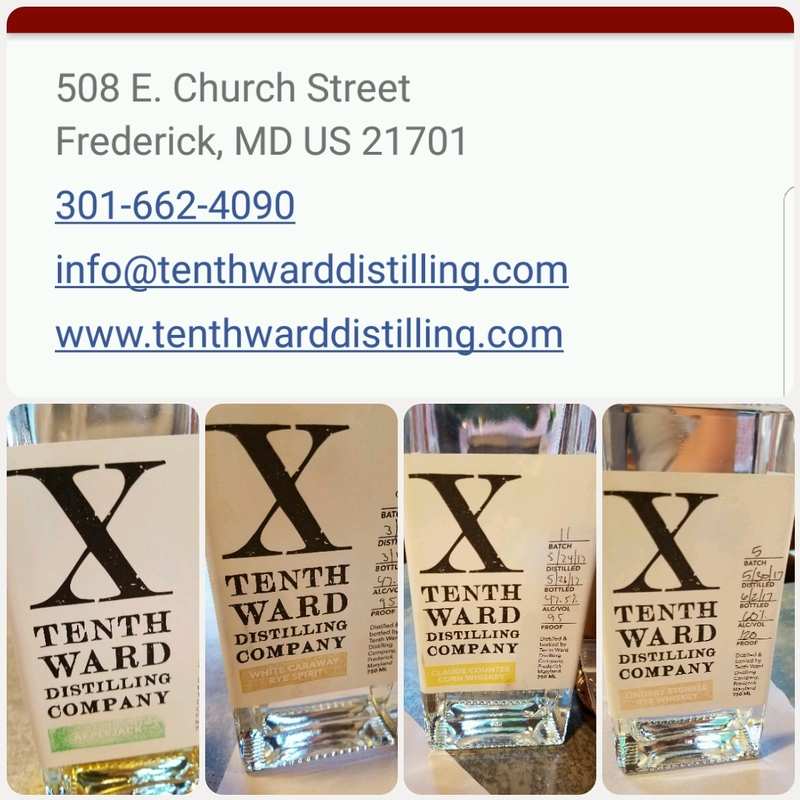 The same evening the two other Frederick City based distilleries poured: Dragon Distillery and Tenth Ward Distilling Company. The former was the area's first distillery when Navy veteran and businessman Mark Lambert decided it was time for a career change. Although the distillery is named after the Dungeons & Dragons game (they readily acknowledge their geekiness), the underlying influence is Mark's great-grand father "Bad" Bill Tutt. This rebel was apparently a doctor, gambler, and moonshiner and their moonshine is based on an old family recipe. The distillery produces traditional spirits like the Joust Gin as well as many flavored spirits such as Fannie Tutt's Lemon Meringue ​Moonshine (named after Bill's wife) and the Medieval Mint Flavored Vodka. In general I hesitate sampling anything flavored but I thought the Medieval Mint Flavored Vodka was very tasty with the chocolate finish that complimented the mint. The gin was clean and not juniper heavy - as I prefer. 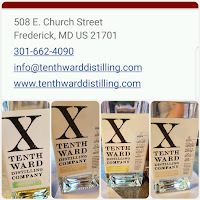 Monica Pearce and business partner & distiller Kyle Pfalzer opened the Tenth Ward Distillery in July 2016 and specialize in "offbeat spirits by experimenting with unconventional ingredients, recipes, and aging techniques". The name “Tenth Ward” is a reference to the way Frederick City was divided during the late 19th century. They source locally with the grain and corn grown, malted, and\or smoked at the Rippon Lodge Farm in West Virginia. 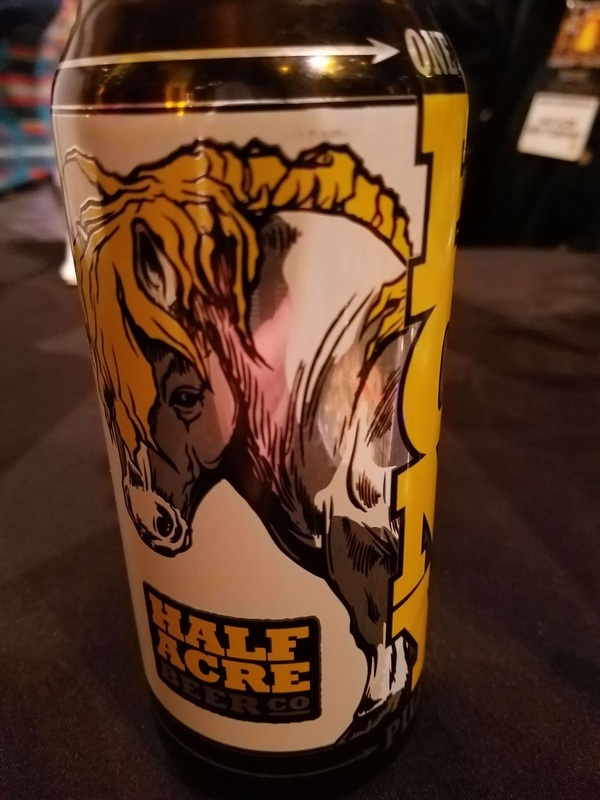 And the cider for their Applejack is sourced from McCutcheon’s, a 4th generation family owned apple manufacturing plant that has been in Frederick since 1938. 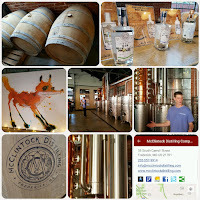 At McClintock, Pfalzer poured samples of four spirits: White Caraway Rye (80% malted rye & 20% malted barley mashed with caraway seed), Applejack (100% apple brandy aged in used bourbon barrels), Claude Counter Corn Whiskey (80% smoked corn & 20% malted barley), and the 120 proof Lindsay Stunkle Rye Whiskey (80% malted rye & 20% malted barley). I was unsure about the Caraway Rye but dug the Applejack and Claude Counter. The apple-bourbon combo was very enticing and the smoked corn adds a peat character to the corn whiskey. The Lindsay Stunkle was hot; next time I look forward to tasting with a little water to dampen down the alcohol. As mentioned previously Ben Lyon, co-owner of Lyon Distilling poured four rums at a tasting at Big Cork Vineyards. The distillery is located in the sailing village of St. Michael's and has been producing rum and whiskey since 2012. Here we will focus on their rum where the molasses and sugar cane juice are sourced from Louisiana and fermented, distilled, and aged at Lyon. Moving from right to left we sampled the Sailors Reserve Rum, Bijoo Batch Rum, Curacao Orange Liqueur Rum, and their Coffee Rum. The first two were solid sipping neat, full of flavor and little burn. I wasn't sure about the Curacao, but loved the Coffee. In fact went back for seconds and thirds. I need to schedule a visit this summer. Cheers. The story behind this ironic situation originated in 1854 when Thomas Goss purchased a tract of land using his Ballarat Goldfields proceeds. For the next 144 years Goss and successive generations of family teetotalers farmed grain and sheep on this homestead. But in 1993 Tony Parkinson purchased parcels of this historic farmland and began to plant grape vines. And "in 1998, Keith Rowland, great-great-grandson of Thomas Goss sold the Ingleburne homestead property to Tony Parkinson ..... which reunited the original Thomas Goss section (80 acres) of farming land". From teetotalers to vineyards. The Goss farm is located in McLaren Vale, an area well suited for grape vines with its winter dominate rain and dry summer days which transition to cool breezy evenings. Parkinson explored the region when he decided to enter the wine industry and first purchased part of the Goss farm in 1988. This parcel would become Penny's Hill Vineyard and the first vines were planted in 1991. In short order he expanded his vineyard acreage and "set about establishing the brand with distinctive 'red dot' packaging and the slogan, 'Proudly Australian. More so McLaren Vale'". The first Penny's Hill brand wine appeared in 1997 with the introduction of the Penny's Hill 1995 Vintage Shiraz. When Parkinson purchased the last section of the original Thomas Goss farm in 1998 the property was used as a cellar for the Penny's Hill brand. However, in order to celebrate the 200th birthday of Goss, Parkinson's recently incorporated Galvanized Wine Group (GWG), launched the Thomas Goss label featuring McLaren Vale red wines and Adelaide Hills white wines. 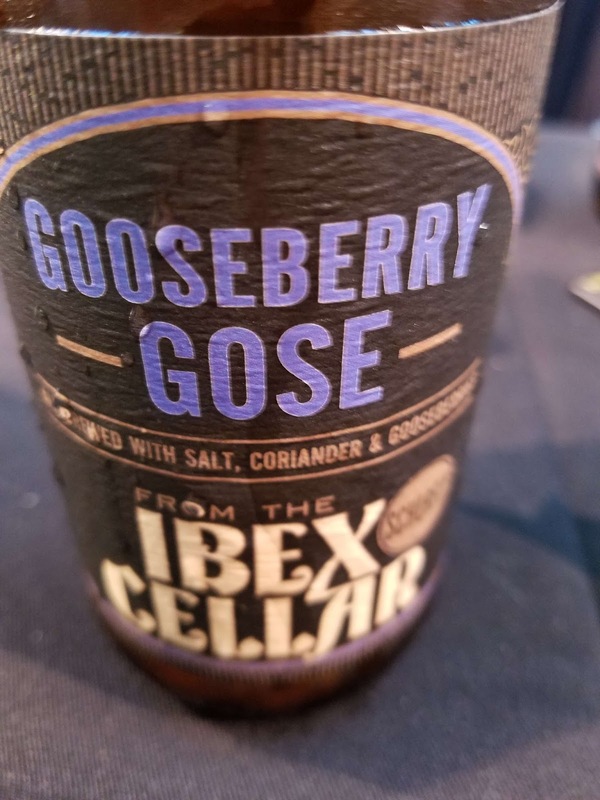 The new label was not only a tribute to Goss and his family's long contribution to the region, but also a playful jab at their teetotaler lifestyle. I learned this information at a recent lunch with Parkinson and current GWG winemaker Alexis Roberts at BlackSalt Fish Market & Restaurant in Washington DC. Their visit to D.C. was near the culmination of a two week sprint across North America promoting their story and wine brands. 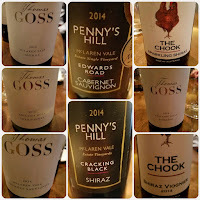 Besides the Penny's Hill and Thomas Goss labels their portfolio includes The Chook (Australian for chicken) which was once known as the Black Chook until lawyers became involved. During the lunch we sipped the wines listed below and discussed the Mediterranean-style climate of McLaren Vale, the cool climate Adelaide Hills, pests (apple moth, rust mites, birds for late harvest grapes, some kangaroo), markets (Canada is their #1 export market), and these delicious and affordable wines. In sum, the Thomas Goss label provides extraordinary value and across the board were excellent; The Chook, more value with a playful flair; and Penny's Hill, class. The latter includes the recently awarded The World's Best Cabernet Penny’s Hill 14V Edwards Road Cabernet Sauvignon. From Teetotalers to The World's Best Cabernet. Cheers. Thomas Goss 16V Riesling ($16.99) - Lemons, texture, abundant acids from large diurnal temperature swine in the Adelaide Hills. Domestic market understands that Riesling is equivalent to dry wine so no need for the International Riesling Foundation scale. Thomas Goss 16V Chardonnay ($16.99) - Fermented in neutral oak plus occasional lee stirring provides a complex and weighty wine that showcases the Chardonnay fruit. Once again, plenty of length and acidity at the tail. Thomas Goss 15V Shiraz ($16.99) - More weight at this price point plus very balanced fruit. The blackberries transitions to slight spice and a bright finish. Thomas Goss 14V Cabernet Sauvignon ($16.99) - More dark fruit, complex with a slightly spicy finish. "Dynamic" for a single word descriptor. Penny’s Hill 14V Edwards Road Cabernet Sauvignon ($27.99) - Sourced from higher elevated five acre block. More elevated, narrow window to harvest. A classy wine, drinkable now but possesses rounded tannins and acids for aging. Recipient of The World's Best Cabernet Enough said. Penny’s Hill 14V Cracking Black Shiraz ($27.99) - Sourced from the Malpas Road Vineyard and aged 18 months with 20% in new French oak, this wine oozes with complexity. The Bay of Biscay clay soil dries to a crackle, hence the name, and limits vigor providing greater grape quality. Expect dark fruit, some chocolate, and firm tannins. The Chook 14V Shiraz-Viognier ($19.99) - Co-fermented Shiraz with a small amount of Viognier provide an enhanced aroma. This is a deliciously smooth wine, very ripe fruit that lingers with the subtle tannins. The Chook NV Sparkling Shiraz ($19.99) - Produced using the Charmat method from between 3-5 year old wine, this sparkling wine has been produced since 2005. There is plenty of body and lift where the fruit and spices linger...... Great value. 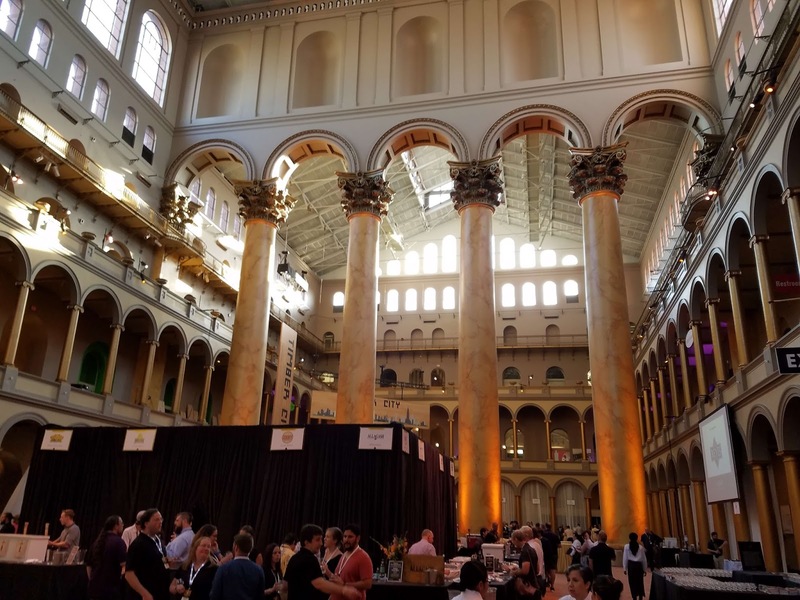 This year the Brewers Association celebrated ten years of presenting SAVOR: An American Craft Beer & Food Experience. And has we all know the craft beer landscape has changed dramatically during those years. According to the Brewers Association at year end 2007 there were 1,449 operating breweries in the United States with 1,406 being craft breweries and accounting for $5.74 billion in sales. Ten years later at the end of 2016 the total number of breweries escalated to 5,301 in which 5,234 were craft and $23.5 billion in sales. And as we know, that number increased during 2017 with multiple craft breweries opening weekly. This growth was no doubted fueled by legislative changes at the national and state levels; using Virginia as an example, the number of craft breweries skyrocketed when the state finally allowed breweries to serve beer in pints without having to also serve food. The 2017 event featured 172 craft beers from 86 craft breweries as opposed to the 2008 event which hosted 48 breweries pouring 96 craft beers. 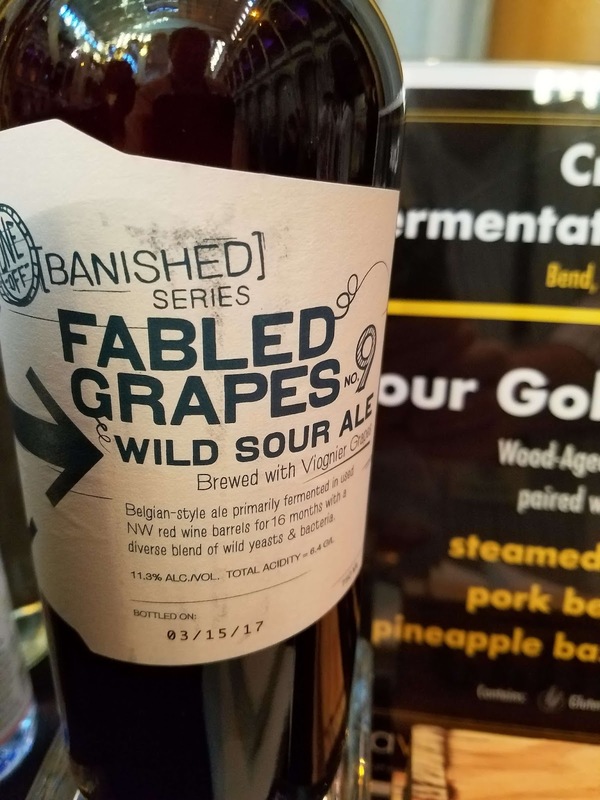 The inaugural event was was most likely concentrated with Pale Ales, English Porters, and a few West Coast IPAs, but over the next ten years transitioned to heavier IPAs, barrel programs, and sours. Whereas the latest event was heavy on the IPAs and sours, session styles re-surged with low ABV Pilseners, Kölsch, and Gose. 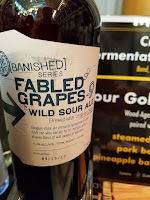 Now I will come off as a hypocrite because I spent half the night targeting the sours and barrel aged beers, with both Crux Fermentation Project (Sour Golden Ale & Better Off Red) and D9 Brewing Company (Defying Gravity Series, 1st Edition - Cape Canaveral & Wild Things Series, 1st Edition - Pearedox ) each proving my favorite beers of the evening. And the Union Craft Brewing Older Pro with Blueberry (Fruited Wood-Aged Sour Beer) and the Schlafly Bottleworks Gooseberry Gose were excellent. Yet I was excited that more breweries were pouring traditional ales and lagers that I feel as a beer culture we are losing focus. Seattle's Reuben's Brews poured a traditional Gose, no extra flavors, just lactobacillus, salt, and coriander. It was fantastic. Did you know that Stevens Point Brewery is the nation's 5th oldest brewery? They've been brewing continuously for 160 years, specifically their flagship Point Special Lager. They also produce the Point S.P.A. (Session Pale Ale) which is my new bicycle beer if I can find it. 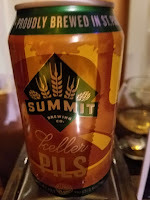 Summit Brewing Company out of St. Paul, MN has been brewing since 1986 making them the 30th oldest brewery. 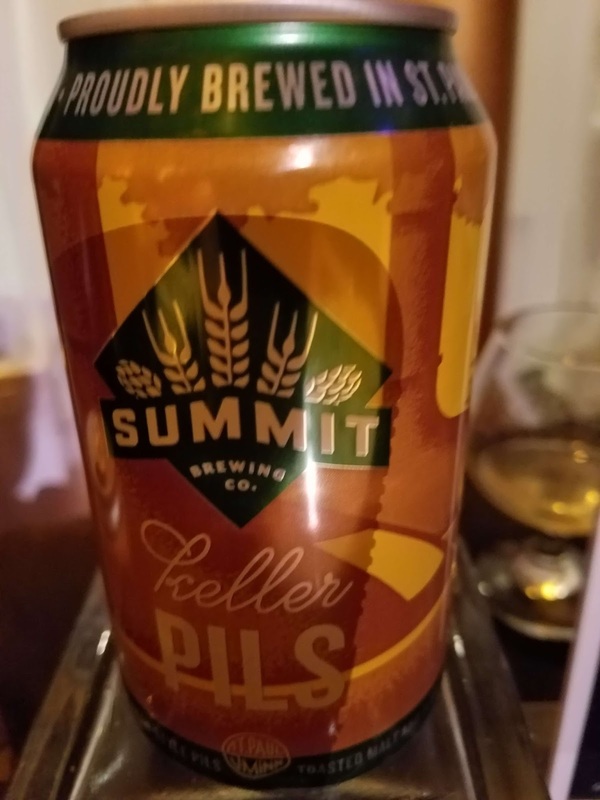 They were pouring their flagship Summit Extra Pale Ale as well as the Summit Keller Pils. The later is nails the style, with North Dakota two-row Moravian 37 barley and Saaz hops from the Czech Republic. An awesome Bohemian Pilsener. 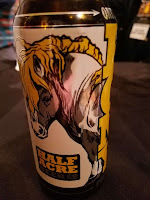 Complementing that on the German Pilsener side was the Half Acre Beer Company Pony Pilsener. Sadly, during my four hours at the event, I seemed to only have tasted through one third of the beers as well as missed the entire upper level of oysters and cheese. Yet, SAVOR was still a remarkable event I I look forward to popping open the collaboration beer: SAVOR X, a Baltic porter brewed with hops and cocoa husks, courtesy of Hardywood Park Craft Brewery and New Belgium Brewing Company. Cheers. Opening a bottle of wine is a commitment, a commitment to finish the bottle. I'm sure everyone has heard a variation of this saying because as soon as a bottle is uncorked or unscrewed, oxygen enters the bottle and affects the wine. Initially that's a positive event when consumers swirl a glass or decant a bottle. At this initial stage, the oxygen enhances aromas and softens the wine by breaking down of tannins. But eventually too much oxygen will flatten the wine by diminishing the aromas and flavor and eventually alter the wine's color to a disagreeable brown. The question then becomes, when dos the transfer from positive benefit to negative hindrance occur? And of course, it all depends on the wine. I recently received a promotional sample from a company trying to postpone that determination by allowing consumers to finish a bottle days and perhaps weeks after opening. The ArT of Preserving Wine offers a can of natural heavy Argon gas to displace oxygen in open bottles of wine. Since Argon is heavier than oxygen it displaces that gas and forms a layer between the wine and the oxygen - thus extending the life of an open bottle of wine. And it must be true if the marketing material states it. Right. 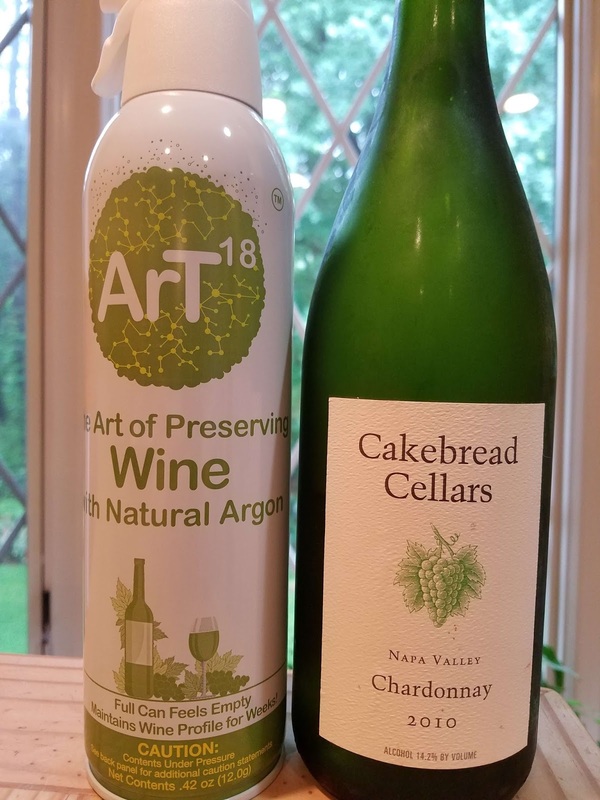 I test ArT on several bottles anyway, both white and red, but was most interested in white wines since they are more susceptible to faster oxidation because of their lower tannins. Plus we seemed to have had more white wines needing to open than reds. I started with several Albarino wines left over from a Snooth tasting and for the next few days as advertised the wines stayed fresh. Very fresh. I then experimented with a 2010 Cakebread Cellars that I feared would oxidize quickly. Unfortunately the bottle was consumed entirely by day two - it is a Cakebread. I took smaller pours with the #ChardonnayDay gift, the excellent 2013 Rochioli Chardonnay. 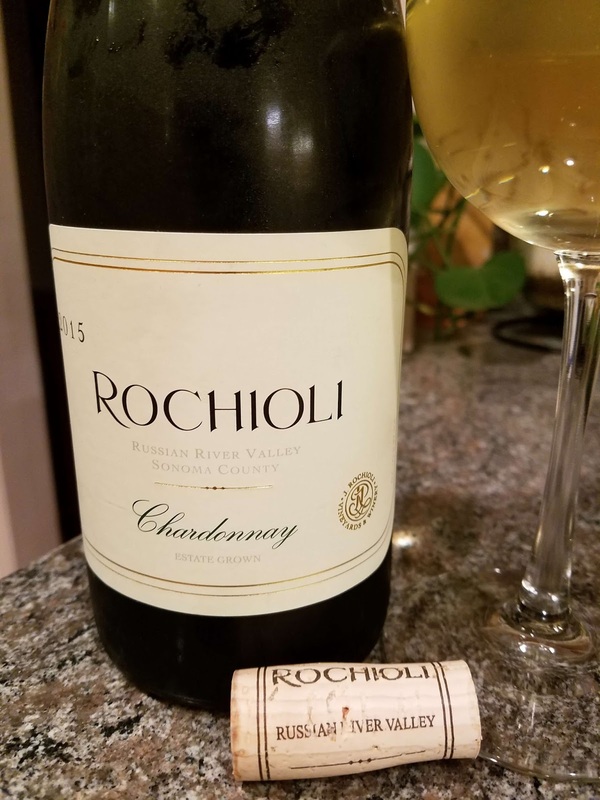 On day one this wine was complex, with buttery and lemon characters and persistent acids. Day two and three showed similar characters with the acids and aromas started to wane on day four. But still a delicious wine at that point. Now I can't verify whether a wine will stay fresh for weeks as ArT claims, but I can for just short of a week. A can retails for $9.99 with 130 uses per can. 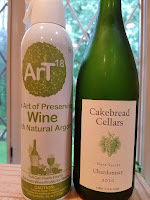 If you can't make the commitment to finish the bottle on opening then consider the ArT. Cheers. 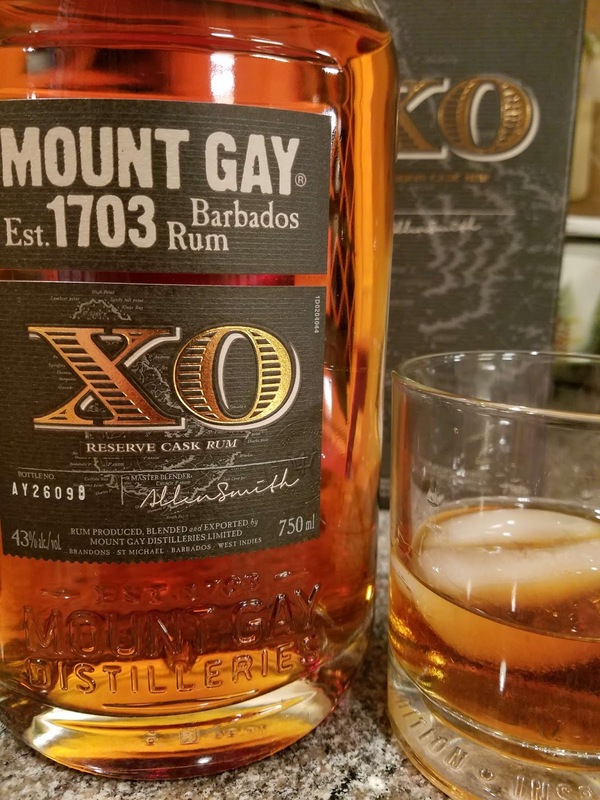 I've been on a rum kick since Spring Break and have continued my sipping with the Mount Gay XO Reserve Cask Rum ($45, 86 proof). Each bottle of Mount Gary rum is labelled "Est. 1703" which is rather self explanatory and makes the distillery the oldest existing brand of rum in the world. Makes sense considering that rum most likely originated in Barbadians and called "Kill-Devil". The distillery is currently majority owned by Rémy Cointreau and is named for Sir John Gay Alleyne, a trusted friend of John Sober, who purchased the Mount Gilboa Plantation/Distilleries in 1747". 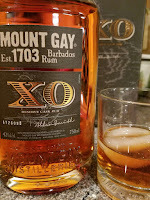 Spirits labelled XO refers to Extra Old and this rum is a blend of 8 to 15 year old spirits distilled from molasses. The rum starts with a nutty, vanilla, and honey aroma that continues into the palate where it becomes a bit chewy and spicy. It finishes with a progressive burn where it's initially completely smooth, but the burn slowly materializes to showcase the 86 proof. Enjoy neat or over ice. Cheers.